My old recordings are on the 2 500GB drives and I will lose them. I have to re-enter my To Do list. I have to reconfigure my Favorite channels. Hopefully this will solve the problem caused by the Directv updates this fall, but I will wait a week or so to make a judgment. Next steps if this fails are a replacement DVR and if that does not work I am going with FIOS TV. Update 12/30/09: Last night I was able to watch the PBS News Hour from the beginning (time shift) while it was still recording without one audio or video stutter. I hope this fixes the problem. Update 12/31/09: Recordings are working fine after I replaced the 2 500GB with a 1 TB drive in my Thecus N2050 array, unfortunately I noticed that the percentage used was increasing rapidly and given the 1TB drive it should not. I went back and checked the Thecus documentation and found that the maximum drive you can put into the unit is 500GB. I am assuming that the DVR is only seeing 500GB of the 1TB drive. Since, I borrowed the 1TB drive from my XPS 720 RAID setup; I would have had to replace it anyway. I went ahead and ordered a Western Digital My DVR WDG1S10000 external drive. Amazon had a better price but they are of stock. I plan to sell the Thecus N2050 with the 2 500 GB Seagate Barracuda 10 drives when I receive the WD My DVR, anyone interested can email me at steve (at) mydigitallife.us. Update 1/09/10: Yesterday I received the WD My DVR 1TB unit and immediately proceeded to install it on my Directv HR20-700 DVR. The DVR booted, found the drive and proceeded to format the external storage. The DVR started successfully, and now all I needed to do is reprogram my recording lists and channel guide. Last night I performed my test where I watch the News Hour from the list, while it is being recorded as well as the NBC Nightly News. The viewing of the recorded portion of the News Hour was flawless (this test always produced audio/video stutter with my original drives). So far everything seems to be working perfectly and I am surprised at how quiet it the My DVR drive is. I will wait a week to make a final judgement. I am also very happy to have the iPhone Directv app to rebuild my recording list, it makes the process a breeze. The WD My DVR drive with the yellow ring status LED looks like a book. Update 1/19/10: 10 days later and the new WD 1TB My DVR drive is working perfectly. It is quiet and definetely run cooler. There have been suggestions that the problem may come back when a new DVR OS version is released. Hopefully that won't be the case, I will just have to wait and see. I wrote about this problem back in November. The disk scan has helped the issue but it still occurs when I am watching a recorded show and the unit is currently recording another. After reading the long threads on dbstalk.com I have decided to replace my external drives. 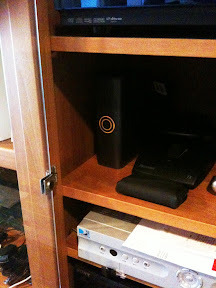 I use a Thecus N2050 RAID array enclosure with 2 Seagate 500GB drives in a RAID 0 configuration providing 1 TB of storage. The Thecus disk array with the 2 500GB drives. The two drives were extremely hot when I pulled them out. I replaced the two drives with one Seagate 1TB drive. If the heat was part of the problem, this should help considerably. BTW what do think of the quality of the picture, it was taken with Droid Hero (very good 5MP camera). Hopefully this will solve the problem caused by the Directv updates this fall, but I will wait a week or so to make a judgment. Next steps if this fails are a replacement DVR and if that does not work I am going with FIOS TV. Yesterday, AT&T released (or should I say Apple) a customer service application for the iPhone called "Mark The Spot". It is brilliant on several levels. From my experience in Washington, DC the AT&T 3G network has gotten better and better (the new cell tower down my street clearly helps), but when I was in midtown Manhattan last weekend I can vouch that 3G data sucked (awful latency) on both the iPhone and the Verizon HTC Eris. The Mark the Spot app is available in the App store for free. After I upgraded to Windows 7, I started having issues with Twhirl locking up. Even after terminating the process using Task Manager I could never get Twhirl to start up again without performing a reboot. My suspicion is that Adobe Air which Twhirl is based on is not fully Windows 7 compliant. The reason I say this is that once the problem occurs, I tried to use TweetDeck (which is also based on Air) and it would not load. The quick fix is to go to start, type twhirl, right click on the program twhirl, click on properties, click on the compatibility tab, check "run the program in compatibility mode", select Vista Service Pack 2, and click ok.